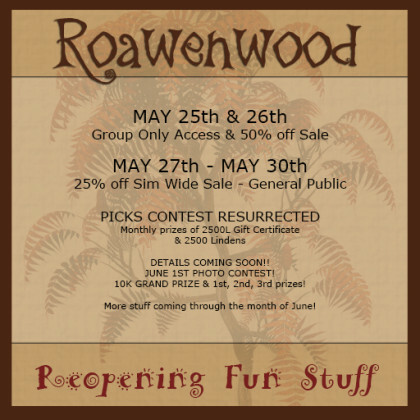 Roawenwood Reopening – The Events! So if you read the previous post which is very…. very…. very long winded you have my congratulations and deep felt gratitude you sincerely have a lot of patience or you’re just way too curious to not or maybe bored… or maybe you just like reading. For whatever reason you did now you get to read more! Ha, bet you didn’t see that coming did you and if you didn’t read the previous post it’s all good, this one is good too. Shorter. With the reopening of the Roawenwood you just knew I would have to do SOMETHING besides babble on in a long post, so I have. First off I wanted to give a nod to my in world group members. A good sized group of individuals some of them being in it or around my place for 8 or 9 years from when I was just starting out for the most part. Some have really been with me through a lot, and some I have talked to quite a bit. I am always humbled to an extent when faced with these people and very grateful, it makes what I do very rewarding in a way. So for those folks who put up with me, my ramblings, and mood swings I gave them a sneak peek. On the 25th of May through today the 26th the store is open ONLY to group members. I closed the group late at night on the 24th so only those chosen few could come by to wander the new wood and to take advantage of a store wide 50% off sale! Everything in the store is marked at a refund of 50% off for those lucky folks. I will reopen the group on Friday because that is when the general public will be able to journey into the woods. Oh hey… Into the Woods, *starts humming along to some of the songs from it. * ok… yes, back to business…. On the 27th when EVERYONE can come to the store and we’re officially officially back there will be a 25% discount on ALL merchandise that is on the Five Blades sim through May 30th. I have been adding little extras as well. 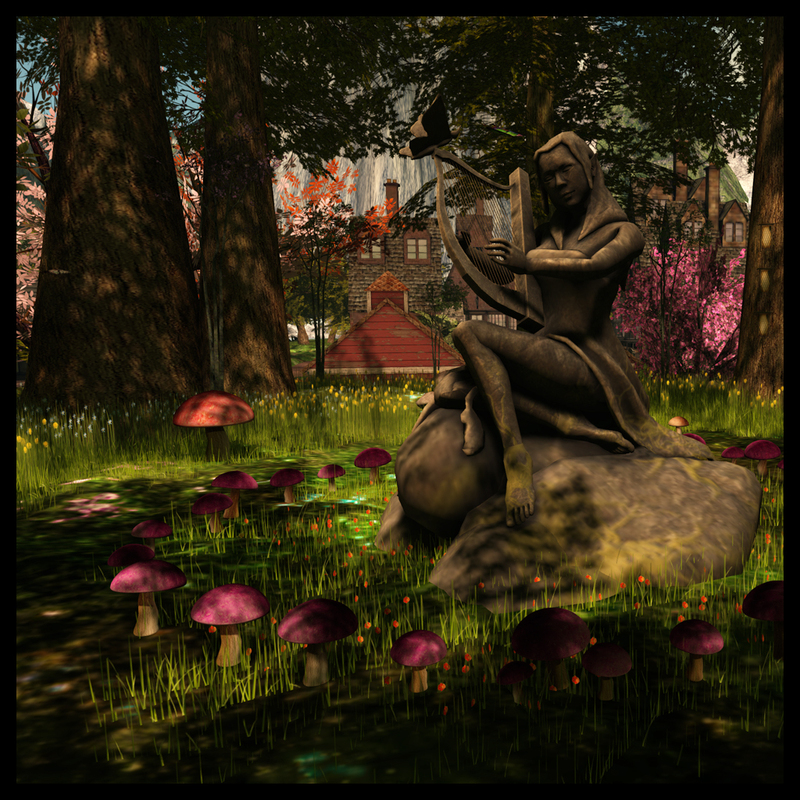 Old gachas have been placed out.. the Sleek Bindings for one, I get requests for that one… among a few others, the Tangleshimmer Grove mushrooms and fairy rings, get requests for that one too.. anyhow.. so you can revisit those, from 30L – 45L a pull. Yesterday for instance I had a limited buy set up. The Galiana Tub marked down to a really low price of 250L for 20 copies only. They all sold before it even got that late in the day which was very cool, so I am trying to think what else should I do this for over this next weekend. The picks contest has been resurrected. Click the sign board, put my place in your picks and at the end of the month a winner will be drawn winning 2500L and a 2500L gift certificate to use or give away. AND COMING SOON!!! A photo contest. June 1st I am going to be releasing details of a contest where you can win 10,000L as the grand prize! Then there will be 1st, 2nd, and 3rd place prizes… hopefully, with enough entrants. *laughs* One never knows with these things. I have plans, always big plans of things coming throughout the month of June. Have fun and talk to you soon. Full steam ahead or something along those lines. After being closed for almost 2 months I finally got the gumption, nerve, or just plain stubbornness to get it opened up. I am if nothing but something of a perfectionist in some things, trying to think up everything that I might need to do or things that I should be doing but not always quite getting there. Or the little touches that make a build good, I can go on and on over them… making it much more difficult than it needs to be. Well, I decided to just batten down the hatches and get it done. So we’re open! The Roawenwood is officially opened up again (though only to in world group members the 25th & 26th – the rest of you have to wait until Friday haha! ), the main store on the Five Blades sim has been totally redesigned and ON the GROUND! Oh… I’ve been up in the sky in boxes and things for far too long, it isn’t something I recommend unless you have something you really like to be honest. But we’re back, the collective we you know… anyhow… I digress. This build is something rather personal. Here’s where I slow down a little bit and if you’ll come with me for a small journey of exploration as I let you in on a few secrets. Yes. This is a store. Yes. It is meant to be shopped and yes it is a business. But then again…. it’s not. The store is made up of several main areas, shopping areas. Two bazaar types with booths of a sort, an area where clothing, accessory stuff is and then a more role-play, landscaping, prefabs type of area. When you drop in you will be faced with the middle basically. The heart of the store, within its heart there is magic, hope, and a quiet place of solitude if you like. There are paths circling and moving through each area so that you can seamlessly move through the store, hopefully not getting too lost in the process since it is big. Big for a reason, one I like to breathe, two… because I think wandering, slowing down and taking a moment can be beneficial. Plus, it can take up a lot of space trying to display furniture builds among other things and I like to stage everything nicely. When I started trying to build my place, my space which is actually over a year now and I never would have thought it would take so long. I wanted something that was “my world”. I wanted my furniture, my stuff everything to be surrounded by… well.. me. I didn’t want to settle for a box with rows of display spaces. I didn’t want to be just another store, or something. I wanted to create something where when you stepped inside you did a quick… “whoa, is this a store?” and get caught up in it for a moment. I’m not saying it had to be a jaw dropping stunning build, yea no, not that. I wanted to evoke a feeling… so I struggled trying to figure out how to balance this want and the business side when it seemed like from the landscape of business in SL people didn’t want what I had to offer in that regard anymore. They wanted quick easy shopping, going to events, who cares about a main store, waste of time, “I just want all my creators in one place so I can go there then go home.” ” What can I buy, who can I buy it from, can I cam shop from the sim next door, don’t make it too laggy, don’t make it too ornate, I just want… want… want…” Exploring, wandering, feeling at home… they had no business in business. At least, that’s how it felt. I felt old, out of time, from a past era of builders and SL that was trying to keep up with the new faster paced and newly meshed version of SL. So I struggled, wondering where I fit, if I fit. Did I want to become something else, not really and it depressed me mightily feeling like if I did not conform to what I thought was the new standard of production almost like it had become a line job at a factory churning out new items just to make them then I might be left behind because to be honest I love to create. I share bits and pieces of me, my passions, my vision, my ideas. It’s all so much fun for me and it felt like it was dying so slowly. Instead of an idea inspired by a vision or something I wanted to give, to help other people create their world it was becoming like an assembly line. Even people around me could see it. Concerned friends and family members wondering where the spark had gone, worried trying to kick me in the backside afraid that I was giving up. I’ll be honest here too. I was. I was giving up. Tired, burned out, and dissatisfied with my creations often. Feeling like something was missing, feeling like it was a real job and by real job I mean the sort where you put on your suit in the morning or your work clothes heave a sigh and wince, “well I’m off to work.” To settle in for the day at a dry dead cubicle to make something because it was expected, and I was in an event or something. I very nearly quietly closed. There were steps made to, you could see it if you knew me… It almost all came to an end, sick to my stomach and sneering not wanting to do it anymore but very sad that it might be. I felt like I was losing a part of myself and that my home… was slowly withering. All very dramatic isn’t it? I never said I couldn’t be dramatic. It took a long while for me to kind of come to grips with what it was I wanted vs what I thought was wanted. And while I know you all aren’t probably _that_ interested in this side of the journey I wanted to do what I tend to do which is share because now… reopening, you get to see that I made up my mind and I like what I have found. SL is SL just like everywhere else, business will change, adapt and then change again. I have always been good at adapting changing chameleon like to make up for the new things coming over the past 10 years. It’s always a challenge because technology throws a lot at you within short periods of time so that has been a lot of adapting but I draw the line somewhere. Here.. maybe it’s because I’ve done this so long but there are parts that just need to be out there and well, those who like what I see… my vision, of a peaceful place. A place to not only explore but to share. Little spots to pause a moment and breathe. It’s not all supposed to be rushing around, it isn’t all supposed to be instant gratification, sometimes… it is the pausing. Slowing down, enjoying what we see in front of us, taking the time to bring a friend along…. So yes, my place is a shopping place but it is also something that I share with you. Forests and groves, fairies and magic. Hope, and a love for the path we take not just the destination. I wanted to bring a little bit of magic into everyone’s lives so that is what I am doing or at least that is my intent. No one can take that away from me unless I let them. If you explore all the little nooks and crannies you will find bits of me. Statues and displays of flowers, things I enjoy or precious moments. You’ll find tributes to loved ones and momentos of events, faires, RFL, and gifts given to me by friends. You will find my love of magic, my love of nature, tranquility and of life. Each corner has areas that have nothing to do with shopping and there’s a lot of little areas mixed in between. Even the gacha redemption spot has little things… pieces and each area I can imagine spending time with loved ones. So while you explore Roawenwood if you really pay attention and take a peek you will see a large part of me from spiritual to mundane to the physical, it might as well be an open book but then that would be too easy. And welcome back to the Roawenwood.